In many states across the country, cannabis reform has been held up by state political leaders. That, in turn, has stalled and stunted business opportunities in the industry. In short, the person who sits in the governor’s mansion can have a big influence over whether state-level reform efforts proceed. Such reforms can include supporting legalization efforts, leading the implementation of voter initiatives and making the market more business friendly with moves such as adding qualifying patient conditions to a medical marijuana program. That’s why this year’s midterm elections may be critical on a state level. 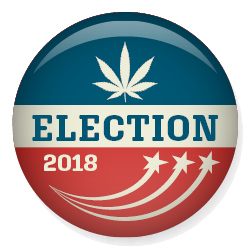 “Governor races could really affect the future” of marijuana policy and implementation, said A. Lee Hannah, assistant professor of political science at Wright State University in Ohio. Take New Jersey, where former Gov. Chris Christie was a thorn in the side of reform. Then came new Gov. Phil Murphy, who endorsed expansions to the state’s highly restricted medical marijuana market, and now patient counts and sales are soaring. What’s more, New Jersey may be close to legalizing recreational marijuana. For all the talk about the increasing bipartisanship on marijuana issues, it’s the Democratic candidates who tend to be more supportive of legalization, particularly adult use, according to one expert. “We’re still at the stage that if a politician is for or against, you can make a pretty confident prediction which party they’re from,” said Douglas Berman, an Ohio State University law professor who writes about marijuana policy. Florida: Democrat Andrew Gillum supports adult-use MJ. Republican Ron DeSantis has concerns. Illinois: Democrat J.B. Pritzker, a proponent of adult-use MJ, has a double-digit lead over incumbent Gov. Bruce Rauner. Connecticut: Democrat Ned Lamont would like to legalize adult-use MJ. Republican Bob Stefanowski is opposed. Michigan: Democrat Gretchen Whitmer, who has a big lead over Republican Bill Schuette, would lead rec MJ implementation if an adult-use voter initiative passes, as expected. New Mexico: The current governor, Susana Martinez, has resisted expanding the state’s MMJ program. Democrat Michelle Lujan Grisham advocates moving carefully toward legalizing adult-use marijuana. Republican challenger Steve Pearce is opposed. Maine: Democrat Janet Mills said she’s OK with adult-use marijuana but wants to make changes in the voter-approved law to ensure we “test it, track it and tax it.” Republican Shawn Moody is opposed to marijuana. Maryland: Front-runner Larry Hogan, a Republican, said MJ legalization is worth “looking at.” Democrat Ben Jealous is a cannabis proponent. Minnesota: The state’s heavily restricted MMJ market could become more business friendly regardless of who wins. Republican Jeff Johnson supports only MMJ. Democrat Tim Walz also favors adult use. Ohio: Democrat Richard Cordray has been reluctant to give his personal views on cannabis but said he would support voters’ sentiment on MJ legalization. Republican Mike DeWine opposes MJ reform. Wisconsin: Democratic challenger Tony Evers has expressed support for MJ legalization. The incumbent, Republican Scott Walker, is opposed.